With the recent return of the Liberal Democratic Party, the cheapening of the yen, and the new 2 percent yearly inflation target, it seems likely that imported goods won't be getting any cheaper any time soon. This is especially true with car gas. Therefore, I would like to share my own helpful hints on how to save a few yen at the pump. One site that I have found particularly handy for checking out gas prices is GoGo.gs. It is basically a comprehensive listing of all service stations in Japan broken down by prefecture. Also, the site offers information on electric vehicle charging stations and graphs charting national fuel price averages. One thing I like about GoGo.gs is that they report both regular gas (regyuraa レギュラー) and high octane gas prices (haioku ハイオク) in addition to heating kerosene (toyu 灯油). While the site is all in Japanese, its fairly easy to navigate with the aid of Google Translate or plug-ins like Rikai-chan. A quick search will pull up a whole variety of service stations in your town, possibly some that you never even new existed! The site also breaks down the prices by regular price and point card/prepaid card holder prices (see below). The one bad thing about this site is that most of the information is essentially crowd sourced, so its up to good Samaritans to report the prices of their local stations. Therefore, if you live in the boonies then expect a lot of info gaps. However, GoGo offers smart phone apps for easy reporting and allows you to filter out results that are sufficiently out of date. 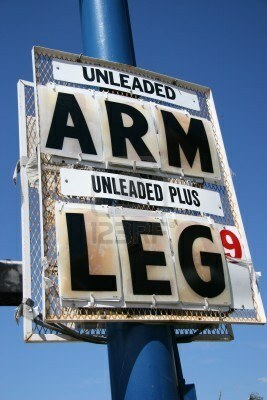 Many gas stations offer special prices to those who either have a point card or a prepaid card. This special prices is advertised as kai-in kaka (会員価格), or "members price." The exact nature of the discount varies, but usually its a few yen off per litter. In the case of point cards, there are too big brands that are generally used: Ponta and T-Points. Showa Shell has taken up the Ponta (see the tanuki mascot to the right) card while rival franchise Enos has adopted Tsutaya's T-Point Card. Using one of these respective cards before you fill up is a great way to save a few yen per litter. In addition, you can save up points (about one percent of your purchase) which can be redeemed at retailers or converted to gas money. These cards only work with cash payments. Another benefit of the point card system is that, if you are a GEOs (Ponta) or Tsutaya (T-Point) video rental member, you can use your video rental card as a gas point card. In addition, Lawson Ponta and Family Mart T-Points are also equally valid. Prepaid cards, on the other hand are a bit different. As the name implies, you charge the card with money at a machine or register then use it at a pump. Cards issued by one particular franchise are usually at stations throughout the country. Like point cards, prepaid cards usually will save you a few yen per litter. Some companies offer extra special discounts for customers who put more than 10,000 yen on their card at once. The downside to prepaid cards are that they are locked to one particular chain and they usually have limits on the amount of money that you can put on them (for example, some can only be charged in units of 5,000 or 10,000 yen). This means that you are almost always stuck with a few extra yen on your card at any given time. The tricky part is that you must pay entirely with the prepaid card if you want to get the member discount.